There is a lot of prejudice against Gaynor Minden pointe shoes. Is it fair, or is it just that ballet teachers are traditionalists and don't like change? The main criticism of Gaynor Mindens is that they "do the work for you." Not many ballet dancers would complain about that! Seriously, though—the concern was that because the shoe did the hard work for you, your feet would become weak. Do Gaynor Minders Make Your Feet Weak? I believe the idea that GMs make your feet weak is due to a basic misunderstanding. When GMs first came out, dancers (and fitters) would choose the same stiffness of shank they were used to in their old pointe shoes. However, because of how Gaynor Minden pointe shoes are made, the added springiness of the plastic meant the shank was stronger than the foot—it would "pop" the dancer straight up on pointe instead of allowing her to roll up through demi-pointe. The dancer, especially if she was inexperienced, wasn't likely to complain because she was suddenly flying up on to and over the box with ease! That's what led to the "weak feet" problem. These days, most fitters should be aware of the need to choose a shank that's not too hard for the dancer's feet. It is difficult to check at a fitting without ribbons or elastic, but the right shank for you is one that allows you to roll up through demi-pointe. If you find yourself "popping up", it's too stiff. In fact, if you're one of those dancers who keeps having to "trade up" to a harder shank because you keep breaking them, GM's may actually make your feet stronger - because you'll be able to use a much softer shank without breaking it. The last pair of Gaynor Mindens I had I ordered through Amazon. The price is very competitive and I received them extremely quickly, all things considered. If you are trying to find a source for these shoes, this is a great place to check. There are plenty of good things about GM's. Comfort, for one thing: for most people, they feel broken-in almost from day one. The box has a cushiony feel, yet you can still feel the floor. The ease of getting over the box is another feature that fans often mention. If you're performing, you'll also appreciate the fact that GM's are quieter than the average shoe. But there biggest "plus" is that they last two or three times longer than a conventional pointe shoe! It's one of the biggest frustrations of a dancer's life that just when she's got her pointe shoes broken in, they die - but not Gaynors. In fact, one of the difficult things about Gaynor Mindens is working out when they've died, as the shoe holds together for quite some time after its use-by date, which can be dangerous (see "Negatives" below). How Weak is Weak Anyway? In the days of Taglioni, dancers had to develop abnormal strength to get on pointe in shoes that gave virtually no support. As the design of pointe shoes improved, the level of strength required for pointe work reduced. Couldn't it be said Gaynor Mindens are just the next step in that process? Does it matter if feet aren't strong enough to stand in old-fashioned pointe shoes, provided they're strong enough to meet all other technical demands? 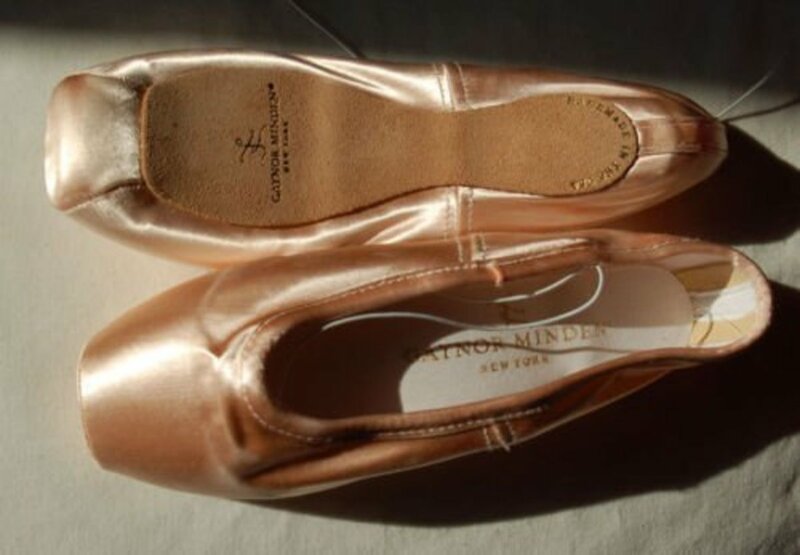 The one thing that few people dispute is that Gaynor Mindens don't look as pretty as other pointe shoes. Even GM fans admit it! The long life of GM's can be another negative, because (as I said) it can be hard to tell when they've reached the end of their life. If you go on dancing on them too long, the shank can snap suddenly, or the shoe can simply disintegrate - not a nice thing to happen if you're in mid-flight across the floor! The early GM's were hard to turn on because the box was too fat - this has been remedied though. That is one of the good things about Gaynor Mindens: they're a modern, dynamic design that is constantly being tweaked and improved. Finally, sewing ribbons and elastic on these can be a pain because of the plastic construction. However, Gaynor Mindens does make their own specific ribbon for this purpose which I have had better luck using than other ribbons. Any other negatives really come down to personal preference and the shape of your foot! On balance, I'd recommend you stick with a traditional pointe shoe when you first start pointe work, just so you know what it's all about—unless you find you're constantly breaking shanks, in which case you may be a good candidate for Mindens. Later on, when you understand your feet and what they need, you'll be in a better position to decide whether Gaynor Mindens will work for you. I naturally have a very high arch so when i started with synergy the front of my foot would fall out it was actually more dangerous for me. Now that I have Gaynor Minden my feet don't fall out and it doesn't look like or feel like I'm going to break my feet in half. This is my second year on pointe. can you deshank gaynor mindens? @Marisa You may be right about the fit, but I still think Gaynor's should be avoided, at least for beginners. 9 years of pointe work and I will probably never go back. They are beautiful, quiet and comfy, but they remove the actual work and muscle memory from pointe work in my opinion. @Evan, it sounds like your shoes weren't the ideal fit. The biggest fitting mistake with Gaynor Mindens is to choose the same shank as on ordinary pointes - which will throw you up on releve and perhaps send you "over the top". It sounds as though you were sinking into the shoe too much, too, if your toes took such a beating! I had practiced pointe for three years, and my instructor always called gaynor's "cheater shoes." I decided to get a pair anyway because they looked gorgeous. They are very easy to releve in, but I had to be careful because it was very easy to go too far over the box because of the provided support. Once on pointe the gaynor's were beautiful, but they were terrible for classwork. I would say they are for "weak feet" because doing in releve exercise, the shoes sort of bypasses using the muscles in the ball of the foot and you're pretty much just using your ankles. Dancing on them was really nice! They look beautiful! But just after one week, both of my big toe nails turned black and fell off! I'm never using gaynor's again! They are good for people who cannot stay on pointe, but you're better off just working in a traditional shoe and getting up on pointe the best way, through hard work! I enjoy reading this hub. I learn something new about pointe shoe. Thanks for sharing. I'm with Marisa, make sure that your teacher is okay. I for example was introduced to the shoes by my teacher, because I have very good muscle memory and crazy strong feet...which means I snap shoes very quickly. I had Dimonds they didn't even last 2 months, I have blochs now and the box is dead while the shank is fine, so those aren't great either. Now, I'm off to buy myself a pair of GM, because my parents are getting frustrated with constant buying of pointe shoes. dancrgrl, just make sure your teacher is OK with that. Some teachers still don't like them, or prefer you to start with a "normal" shoe to learn what that feels like. I love this article! It's beautifully written and the photos are lovely. I have these shoes for one reason and that is to make my arch better. Because of the broken in arch they push my arc (I am flat footed) and makes them look so much better. I almost purchased some, but the store didn't have my size, so I went with Gambas. I have researched these shoes extensively but have yet to be fitted for a pair. 'Weak feet' ha! I understand what it means, but I think the concept of anyone en pointe having particularly weak feet is just funny. Wonderful hub just for dancers, very informative!